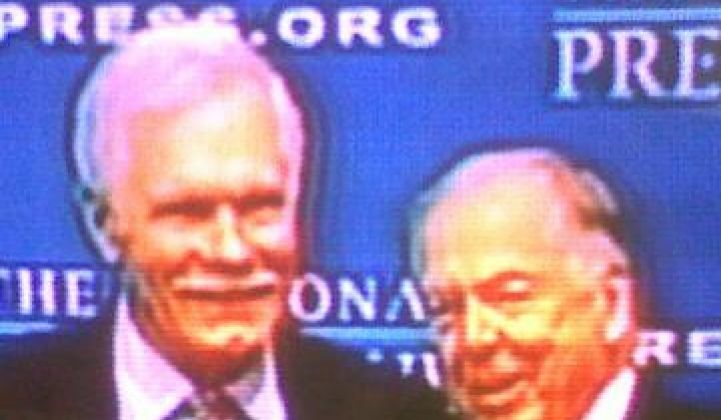 Ted Turner and T. Boone Pickens, two rich, famous, gifted gabbers with big stakes in energy who made a joint appearance at the National Press Club on Tuesday, are uninhibited about saying why U.S. energy policy remains fundamentally unchanged. It is likely Pickens wanted to do a push for passage of H.R. 1380, legislation that would subsidize a transition from diesel gasoline to natural gas for heavy transport, and got his pal Turner, once known as The Mouth of the South, to join him. Pickens’ vision is based on the Southern California trash truck fleet transition to natural gas led by the Air Quality Management District’s Barry Wallerstein. “Infrastructure will come with the transition,” Pickens said.